I hope everyone reading had a wonderful holiday weekend, if it was long or short, that if you were out shopping on Black Friday, you found exactly what you were looking for and got it at a good price, and I hope, I truly do, that you've not had problems with traffic heading home, and that you're ready to go back to work tomorrow. Are we ever ready for that? 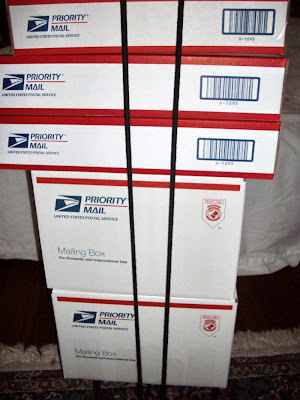 I've spent my weekend getting a little rest (but not a lot) and working a bit on some holiday gifts (which of course I can't show you), and also managing to finish the last two orders I had outstanding deciding that Nana Sadie Rose can extend her holiday order deadline to December 5, 2009. And I've done some cooking which you can read about over on Nana Sadie's Place. And while I stayed in on Black Friday, I did venture into the mall on Saturday, picking up a few items I needed for holiday gift projects. But mostly? Mostly I worked on putting together some items for your shopping pleasure over at my Etsy Shop. 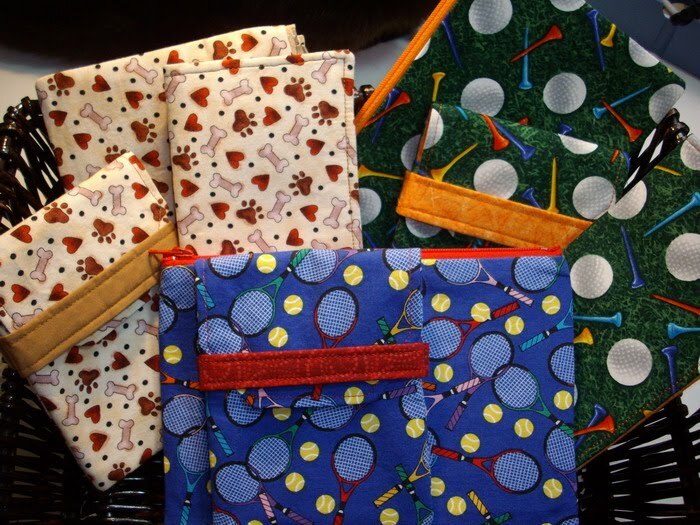 The prices are low to encourage you...it's my little gift to my good customers in advance of the holidays - enjoy a price reduction on me, and pick up the "little somethings" you'd like to add to your gift-giving this year. 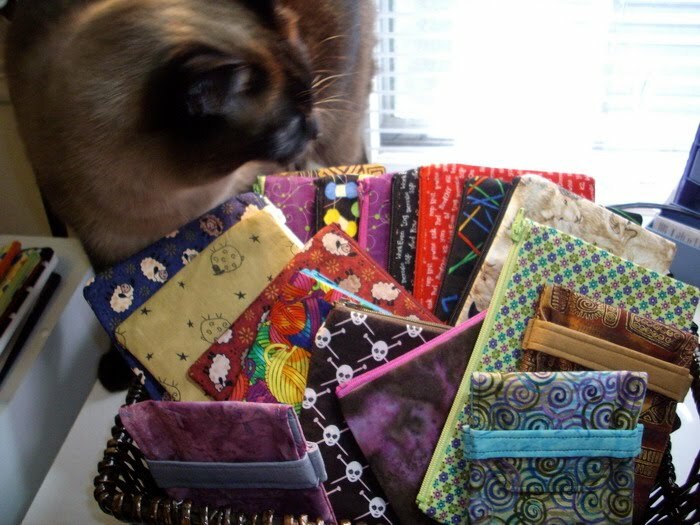 And of course, my favorite Siamese feline has been a constant companion all weekend...as you can see, she has to inspect all the merchandise before it leaves the sewing table. But right now? She's sitting in front of the oven...there's a turkey breast in there cooking away and she's not going to miss even the smallest morsel that might hit the floor! 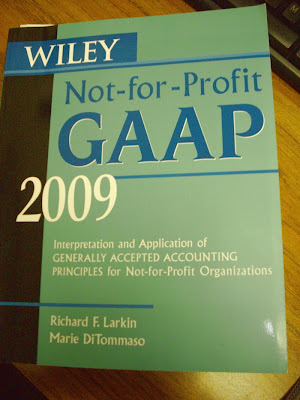 Look What I Unearthed Today? Turkey-Day Dinner was quite satisfactory. I stayed within my plans for the dinner, and didn't go over my allotted points for Weight Watchers. I'm pleased. DD said, "Well, what can you eat? Nothing, right?" and I was happy to reply, "I can eat anything I want, as long as I keep portion control in mind, and make healthy choices." It's exactly what I did! Then I came home with some thoughts to finish the job I started last night, cleaning off my desk. I was so good. I reset the computer into a more neutral position and removed the full-sized keyboard that I've been using. I can't seem to give up my mouse, tho' I've been using the thumb pad on the laptop, but I like the mouse control better. I do switch back and forth, so the day might come when my mouse and I part company...we'll see. Still the desk itself had to be unearthed for this process and I'd tossed all the papers on the floor yesterday saying "no longer than 30 minutes on the floor, I AM going to clean this up." Well...it was more than 30 minutes, but everything was organized and filed (even in file 13A, the shredder basket) this afternoon. And then I got interested in finding a frame for a photo of my grandsons...that involved pulling some boxes down from storage (I'm always amazed at what I have that I've completely forgotten...and it's made me think more in terms of the old "use it up, wear it out, make it do, or do without" mantra I used to live by). 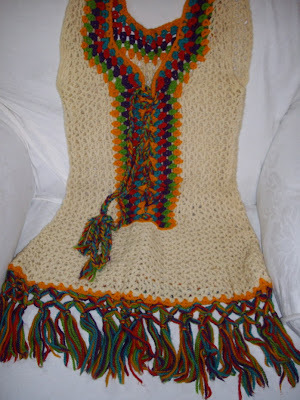 When I was a sophmore in high school (which was 1972) the crochet pattern for this was available in Seventeen Magazine. I have a memory of it being on the cover, but it might just have been a full-page photo inside the magazine. I tried to link to something, and can't find it, even on the Seventeen Magazine site, which does have a section for historical covers. I don't think for a minute that they're all up there, but still, I can't promise this was on the cover. The yarn is probably Red Heart, I know it's acrylic, but back then, I'm sure it was all we could afford. It doesn't matter. The Hippy Chick in me still thinks this is the coolest thing in town. Thanks, Mom...Happy Thanksgiving, I miss you. Here we are, THE day to be thankful, and I've had a month of Thankful Thursday courtesy of Carole having this lovely idea...I'll try to finish up the month with a few odd things I'm thankful for, having spent the last weeks already mentioning all the most important ones! 1. I'm thankful that my mother's family was raised vegetarian. I have such an appreciation (not to mention, a recipe box full of fabulous recipes) for all vegetables, but especially for the autumnal bounty. 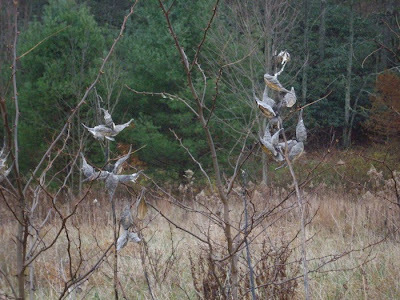 Our family Thanksgiving Day has always been more about the Three Sisters (squash, corn, and beans) than about the bird! Give me the side dishes, please? Even on Weight Watchers, I can enjoy my traditional favorites without a twinge of guilt! Especially since WW gave me a way to enjoy "pumpkin pie" via pumpkin fluff - Just ONE point! 2. I can't thank my grandmother and mother enough for the training in the domestic arts - sewing, knitting, embroidery, and food preparation and preservation. 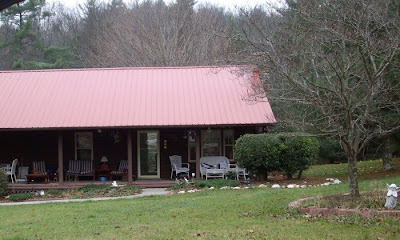 I don't think any of us were much on the housekeeping (tho' Mom was better than I), but the handcrafts, whether done for necessity (my Mom), or by desire (my Grandmother and me) gave us a lifetime of creativity. Then by Sunday I'll have shopped a bit but will also have stocked my Etsy Shop with lovelies for you and yours this holiday season, so do stop by, okay? I promise you that will make me even more thankful - you all are the best! 1. My Subaru Forester. Roomy and great in bad weather, but not too far off the ground, with heated seats, and easy on the gas. I love it. 3. My magazine stash...I will never run out of resource material in my interests. I can re-read to my heart's content (some of my passions have been decorating, yoga, Buddhism/Meditation, sewing, art quilting, knitting, history of needlework, feminism, herbalism, education...) and never worry about buying another magazine as long as I live - and it does keep me from buying new ones in certain subjects! 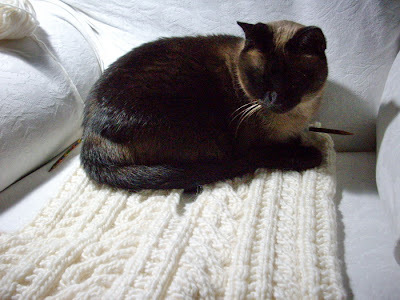 Miss Muffin (one of my "silent" pets) is modeling the latest toe of Online Supersocke 100 Sierra Color which I bought at the very first NoSoKnit I ever went to. 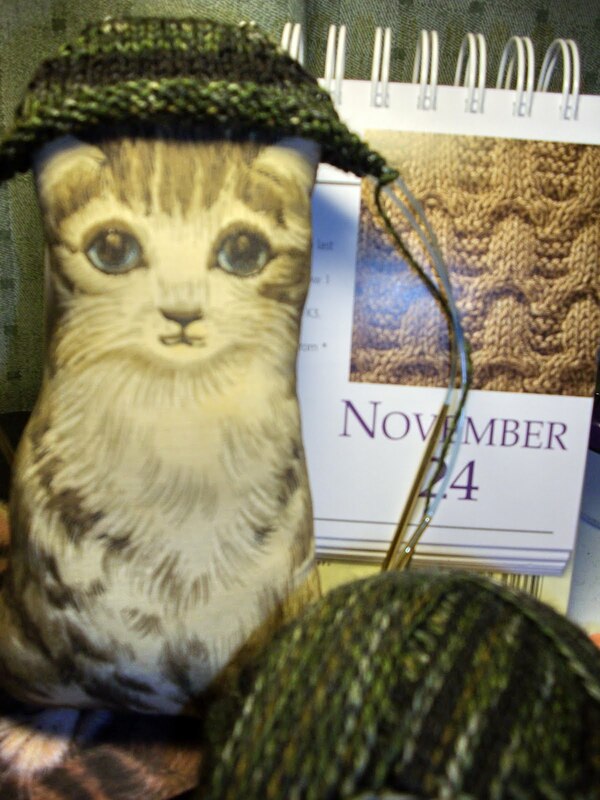 It's a wonderful striping tweed yarn, in olive-forest green-black with a touch of caramel tossed in for good measure. Not only are they gorgeous, but I am in love with this yarn - hmm...a competitor to Trekking XXL? Wow! I'd originally thought I'd gift this, but I'm really really going to be selfish here and keep them for myself. Well. Shoot. That's not in the spirit of thankfulness, now is it? The Weekends Are Always So Short! Even if I do get a lot done, I usually end up wondering how Sunday night got here so fast...it's not a lack of a feeling of accomplishment, I promise you - because I really did a lot this weekend! I'll start by thanking everyone who commented on my sweater advice question on Friday night, and for those who emailed me privately. I think I'm going to be fine with the row gauge. And will probably embark on this sweater journey in December, possibly after Christmas when things settle into a bit of a lull in Knitnana-land. I frogged the Red Hat Sock (that's what I've been thinking of it as, even if it is called Wicked Stepmother...). 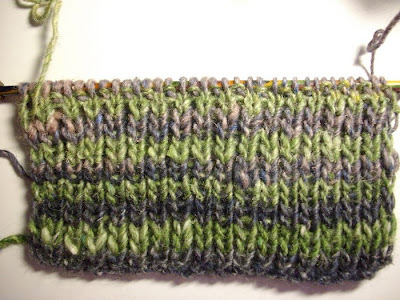 I will use the yarn for Jo Sharp's Misty Garden Scarf from Scarf Style. I can't cast on for it, right now, because I'm using my size 8 bamboo straights on the yoga pillow. Which is almost 1/2 done. 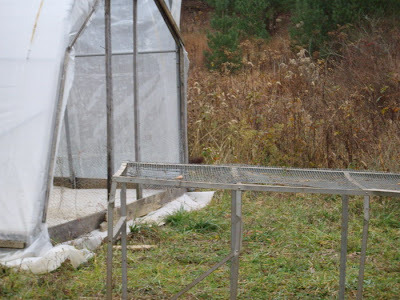 I've got to figure out the filler for the pillow and then determine if a ready-made one, purchased, is appropriate, or if it would be possible to recycle the stuffings from something I already have (oh! Recycled Sari Silk yoga pillow with recycled pillow stuffings? Poetry!). I spent yesterday alternately running up and downstairs doing laundry and at the cutting table cutting out orders for Nana Sadie Rose. 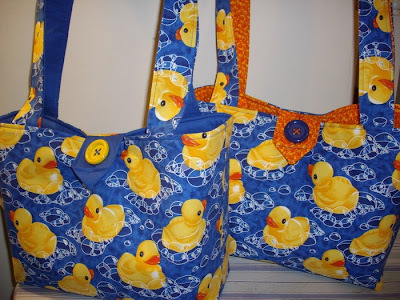 I'll be taking orders for the holidays up through November 28, and possibly beyond, so get with me if a Nana Sadie Rose item is on your wish or gift list for this year? And for dinner, I made myself a huge pot of Veggie Spaghetti. It was yummy and I'll be enjoying it for a couple more days...I finished the evening off by working on the Helsinki Hat Scarf - those cables are just the thing, lately, to wind down with and the yarn (Lamb's Pride Bulky) is just heavenly...so soft and warm! Anyway, I have other baby fabrics available of course, and there are tons of different prints out there, too. Big Sis has chosen a different print for her other two gifts. 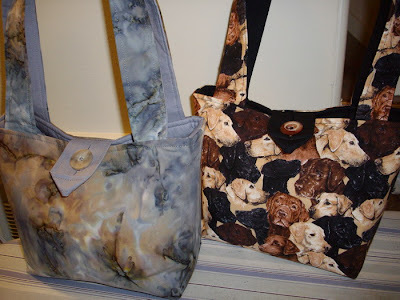 They're not needed for a bit and, not to worry, the mom's don't read my blog, so the surprises are safe (they also don't know each other, so the likelihood of seeing each other with a similar bag is slim, too)! So now? I think I'll go see what the pillow situation is around here. Oh. And get ready for work tomorrow, too! Am I crazy? I can't start it yet, quite, because I'm either going to have to order another set of size 5 Harmony tips from Knitpicks, or I'm going to have to find the ones that came with my set of interchangeables. 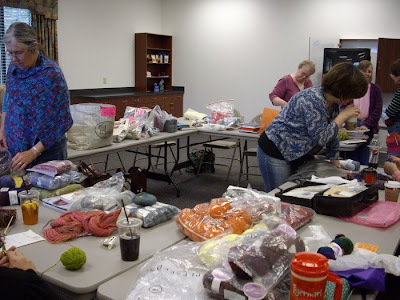 I'm not in the mood right now to tear the knitting room apart. And I'd really like to finish something. Anything, frankly, since my track record hasn't been that great lately. And I'm going to wait for advice on the gauge from you all. I opened it and took a few minutes at lunch to read some of it. Last night was Red Hat Ladies, and I was terribly bummed by the fact that I'd spent quality time with the O'Charley's nutrition website and thought I had my dinner all planned, only to discover that the way they made a certain substitute for dressing on the salad made it impossible for me to eat. (Pico de Gallo, the last time I checked had a nice mix of onions (often green), peppers and tomatoes and cilantro in it, NOT 90% chopped raw red onions, which of course, don't agree with me - but it was too late, it was all over the salad - and at my request). 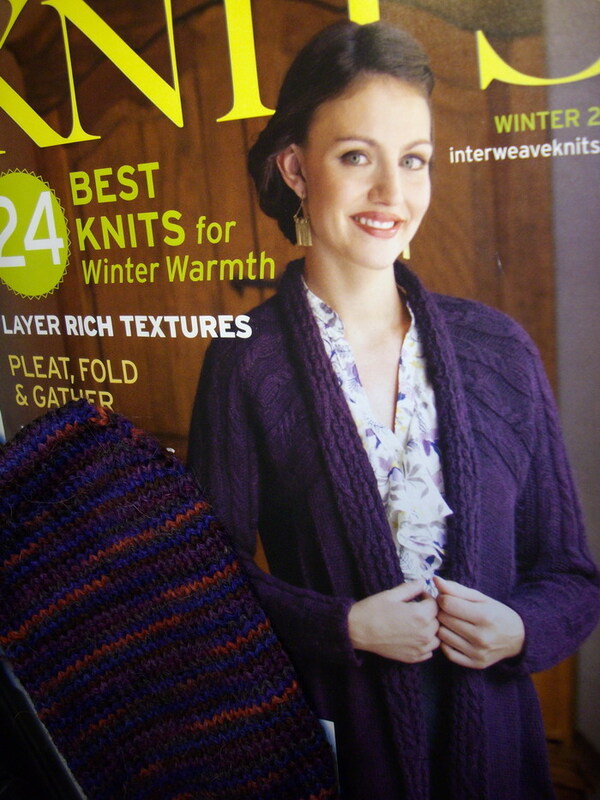 The cover of Winter Interweave Knits! OMG. I'm in love, I think. Next to it there, you'll see the Red Hat sock I'm working on. I think it's going to be ripped (yes, I know, my track record lately is pretty poor, huh?). 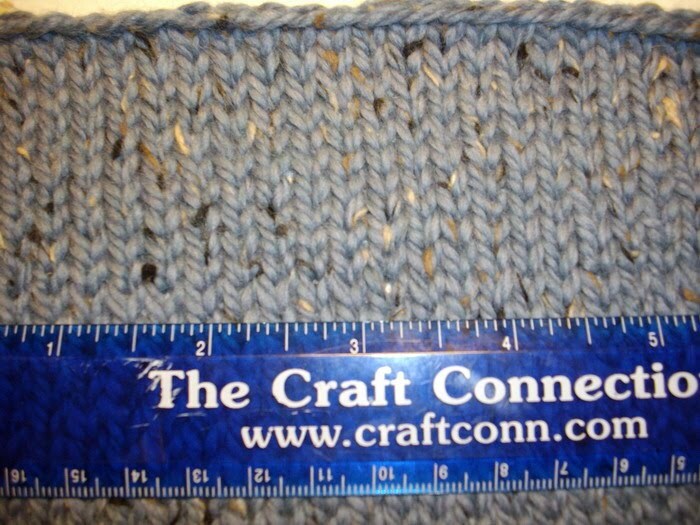 The yarn is lovely and soft....too soft to hold up to the wear I put my socks thru. 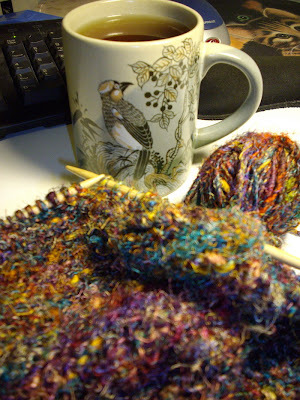 Maybe a nice feather and fan scarf? Can you believe it's Thursday again already? 1. Weight Watchers, and the decision I made to join. Every week, regardless of the amount I lose (or don't) I meet up with folks in the same boat, who have great ideas, and mostly positive outlooks (and by the time Meghan gets thru with us, we do again, if we didn't when we came in!). I'm especially grateful to be 10 pounds lighter right now, and feeling the difference in my hip and spine. YAY! 3. I'm thankful to have lived in the same town for my entire life (except for a few months in DC, during which time I was plotting my return). I know that seems strange in this era, and it's not a little bit unusual. But this town, with all it's idiosyncracies, is just about the best place in all the world (I might just be a touch biased). Politics aside, I am grateful to live in a beautiful place, with friendly folks, and a decent standard of living (for the most part). When I leave? I can't wait to get back. While I'm here, I drag my feet at leaving. 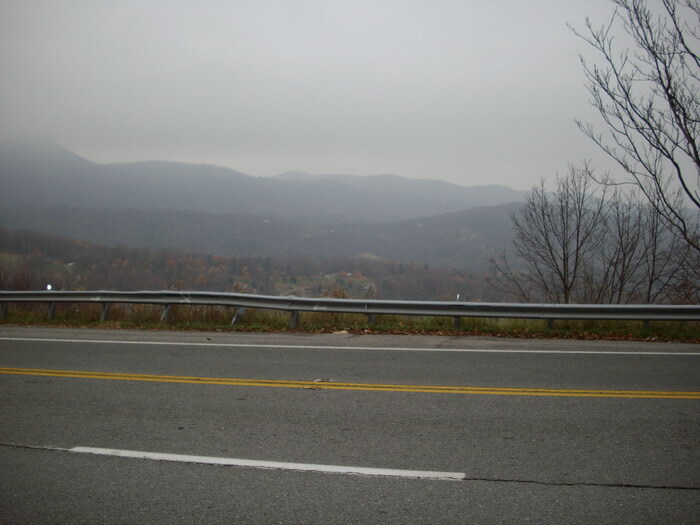 I come across Afton Mountain from the DC area and as soon as I spot the Blue Ridge, a space in my chest expands and I realize I can finally take a full breath again. Who knows why? It's home. And it's mine. Blessed Be. Ever since I signed up for the Community Supported Agriculture program way back last February, I knew this day was coming. I've had it marked on the calendar as a vacation day for some time, and I have to admit, I wasn't anticipating it in a good way. About a week ago, it dawned on me that this could be fun, even tho' I knew there'd be physical work involved, tho' I also knew it wasn't going to be back-breaking work, by any means. I've been less uncomfortable about it the past few weeks as my back got better and, besides, I could do a photo essay for you! Whee! What did I have to do? Drive to Check, VA and bring shares of the CSA back to Roanoke for distribution. Now, if you're wondering, yes, Check is in a rural county, about 30 miles from where I live. And it's up Bent Mountain. There's a reason it's called that. The road up, while 3 lanes wide (it's the NEW road which has been there as long as I've been driving - in fact, my first day in driver's ed I had to drive UP it! ), is at an 8% grade and so many S-curves that double back on themselves in such a way, that if you're not the one in control of the wheel? Motion sickness is a real possibility. 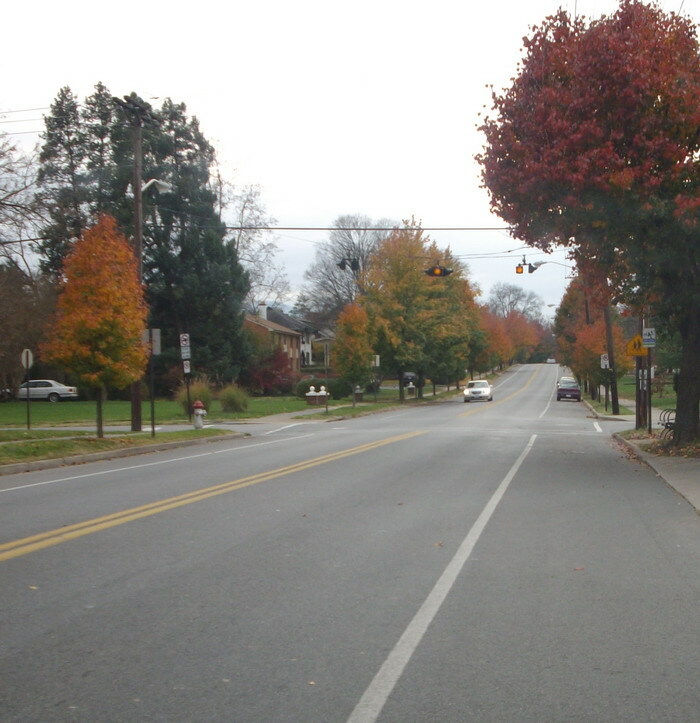 It's a dangerous road, and one where many accidents have occured over the years. The posted speed limit is 25 on those turns. I'm able to do 35-40 most of the way up, but the locals just flat-out fly by me. One of the big reasons I've been dreading this day, is because I could not predict whether the day would be sunny and if it was? 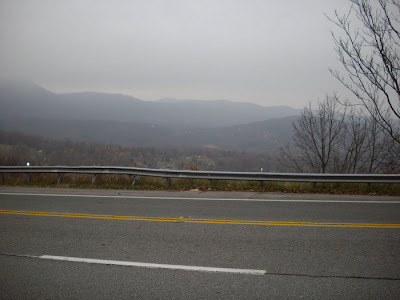 Driving that hour up the mountain and the hour back could have posed a major problem for me. I stopped mid-way up the mountain (not the smartest thing, but there is a shoulder, so I could walk back and snap this shot for you...I didn't dare cross the road to point the camera down the mountainside. Scary! 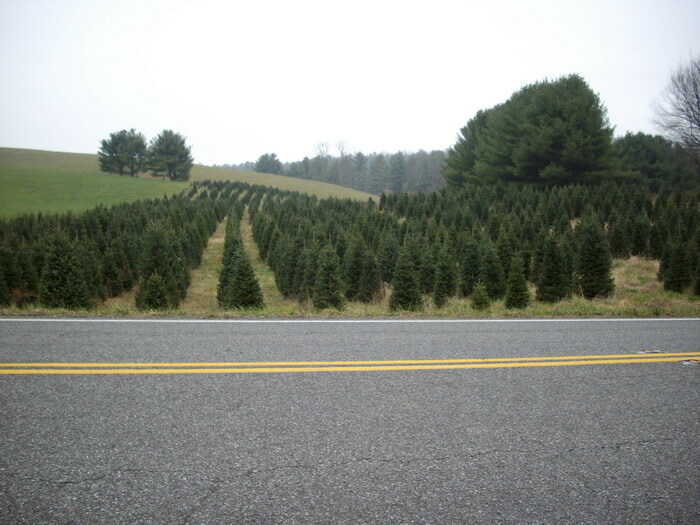 Back in the day, the "back-to-the-land" movement of the 70s, many folks moved to Floyd County to start farmsteads and one of the ways they survived was to raise Christmas Trees. Small farms and nurseries, the land is so hilly that's about all you can have, but I did see lots of cows this trip. I looked for sheep, but saw none, tho' I'd have thought they'd be good farm animals up there. The tree farms are thriving businesses 30 years later. 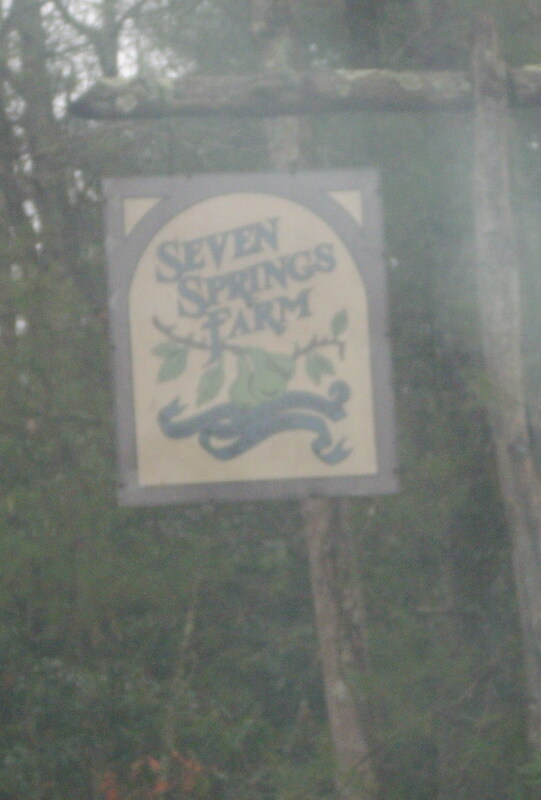 The farm sign greets you. Of course, that photo is thru my windshield, but the mist was heavy at that point, too...it did lift a bit later on. 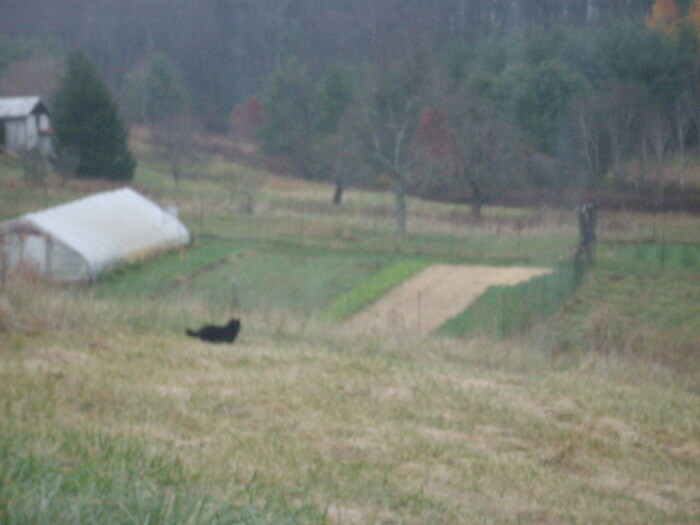 I carefully guided the Forester down the farm track to the CSA barn at the back of the property...when I got out, through the back of the barn, I spied a cat. That dark gray blur at center of the photo in the right angle formed by the cold frame and the wood frames? She took a flying leap just as the shutter went off. where she was already way ahead on bagging the shares. 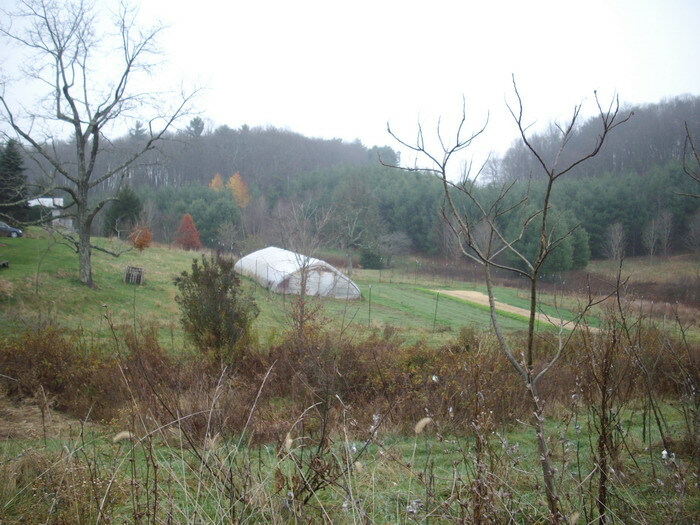 As I drove off, I caught this view of the farm, still showing some of the greens growing...cold as it is! And just a bit further down the track? The cat reappeared and I quickly snapped her photo - but I really do think she's camera shy, because she looked back at me (showing a lovely white vest) as if to say, "HA!You didn't get my best side!" Doesn't this look cold? And dreary? I love winterscapes, and this shot of seed pods was quick and through the open car window as I drove off the farm. I am glad it turned out, even if only a little! But not for much longer. After all, it's mid-November! This week's Ten on Tuesday question is "Ten Things You Wish You Knew How to Do"
2. Spindling. I know. 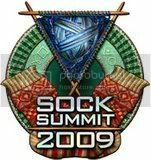 Taking a class at Sock Summit wasn't that helpful, and someday I'll take another and finally learn, perhaps from Toni at The Fold, because I liked her teaching style when she demo'd at SS09. But for now? It's a matter of time, mostly. And not really wanting to expend what I know will be outrageous sums of money once I finally learn and then have another fiber habit to support! 5. I've always wanted to learn to play the harpischord. Well, that's more money than time at this point. They're not cheap, and neither are lessons. Not to mention the space requirements of a harpsichord! 7. 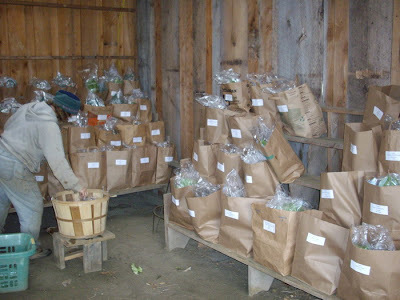 Herbalism - as in growing them, harvesting them, putting them into tinctures and potions, and using them appropriately. Once upon a time, I wanted to attend Rosemary Gladstar's herbal school in Vermont. Or Susun Weed's (you don't have to run the add-on, there). But since I'm very grateful for the home I'm in, and I don't have garden space outside and not enough interior light to grow anything inside, that's probably a "not unless I move" wish. 8. Along with #7, I also have always wished I could raise sheep and have a farm (even just a few acres)...I enjoyed gardening when I lived at my mom's (my daughter jokingly refers to my tomato forest when the subject comes up) in the early 90's, but I think probably the time in my life for that experience is long gone. However, I still swoon over white and black woolies dotting green landscapes when I travel north to the Shenandoah Valley and see the sheep farms there. Oddly enough, there are variations of all those things that I could do, and probably will. I've got a lot of time and space to fill ahead of me (I hope!) and with a little luck, some budgeting, and willingness to try new things? Yup. Most of them will be tried (ok, maybe not the sheep farm). On the subject of yoga? I forgot to share this other new project with you on Sunday. 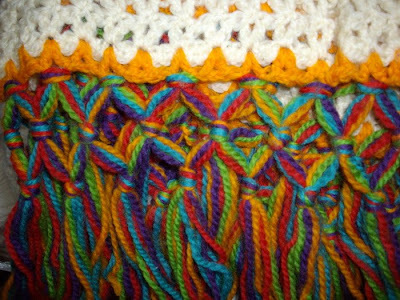 It's recycled sari silk that was gifted to me a few years ago at one of our holiday parties with the Roanoke Valley Knitters & Spinners group. 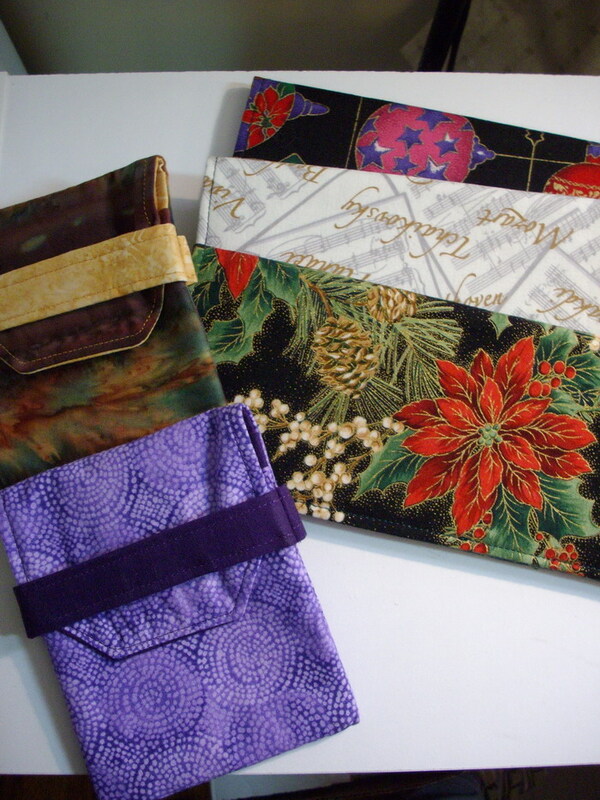 I've been wanting a smallish pillow to sit upon at yoga class (have been using a folded blanket which works, but...). 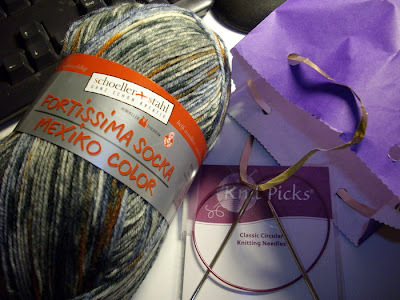 I'm hoping the two skeins will be enough, but there is a third one if not. It will be a sort of crazy-quilt styled pillow cover, there's no doubt about that! And any scraps left over will be added to the crazy quilt stash - it's too pretty to toss out! 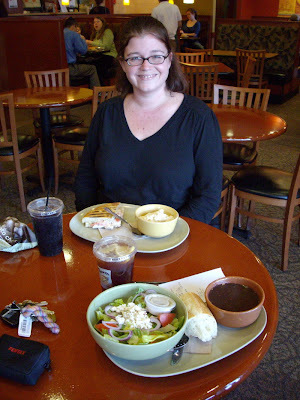 Tommorrow is my Dear Daughter's birthday, and she'll be working (and I have yoga class), so we celebrated at Panera today (I think I did okay on WW points, but if not, I'll spluge and accept the weight loss/gain/no change results no matter what). She had a sandwich and their new macaroni and cheese, mentioning that HER Nana (Nana, the First!) would have loved it because it's made with Vermont cheese. I had to remind her that her Nana would have found fault with it because there was no crumbly crust on top. And no, I didn't have one bite (but it was hard). Instead, I had the black bean soup and 1/2 a Greek salad, with the balsamic sugar-free dressing on the side. Oh, and a side of their bread. I realized too late that I didn't get my usual multi-grain - I have no idea why. 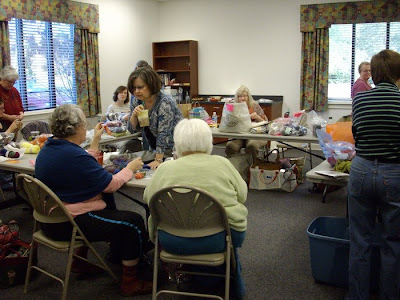 And folks spent a lot of time shopping instead of knitting. 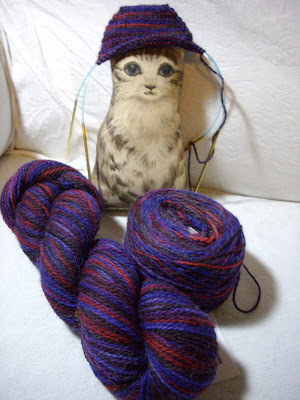 I swapped with Christy for this lovely alpaca blend yarn from Lion. (DD has her eye on something from this...we'll see! But the piece-de-resistence? 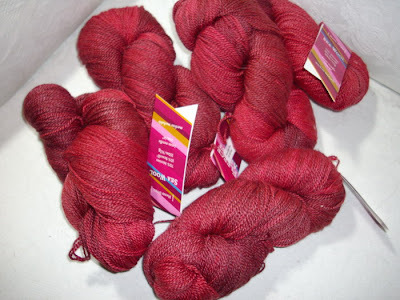 Fleece Artist Sea Wool in the most wondrous reds. Now to find just the right pattern (there are 5 skeins there). All in all? A terrific day - and my daughter and I had a great time celebrating her birthday. She says she wants to come back to our group again next month! More Than Usual - TGIF! 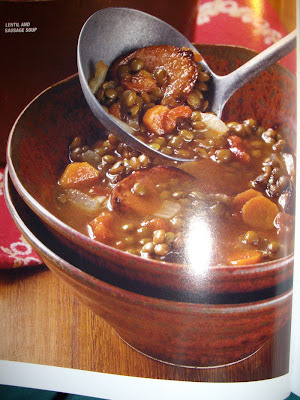 This week at Weight Watchers they were having a half-price sale on cookbooks, so I indulged and picked up the Momentum Cookbook and almost the first thing I spied was their receipe for Sausage and Lentil Soup (with turkey kielbasa, one of my favorite things). I really have to accept that older tummies have to be cared for more gently. It's not something I'm happy about but, there are, indeed, worse things in this world. The joint achiness from the cold rain and pressure changes was kept at bay till yesterday evening when it hit me hard! I'm finally starting to feel better (the storm has passed and finally late afternoon today, the sun came out, it will be 72 on Sunday, so they say!) but I'm still taking it easy, playing it safe. The past 24 hours or so haven't been much fun. But - I think I mentioned that I dug out Helsinki Hat Scarf (Ravelry link) and began working on it again? I've been enjoying the amazing softness of the Lamb's Pride Bulky yarn and the wonderful way that yarn makes the cables pop! 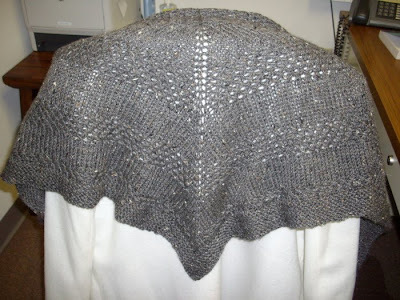 I wanted to show you, so I arrayed it on my knitting chair, under my Ott light so you could see the cables nicely, and off I went for the camera (it was just across the room!). (wouldn't you know I've got the opposite problem from Geraldine! Mohair drives her every bit as wild as catnip! 1. The feline members of my household. The Meezer's adoration and devotion are the stuff of Siamese legend and anyone who is owned by one doesn't need me to tell them how wonderful it is to be the recipient of it. And even if she is a calico, with all *itchy-ness that can mean, CC has brought much to my life. She challenges me to come up with ways to soften the edges of her curmudgeonly grumps - tho' it's not easy. But she also teaches me what I hope not to be when I attain an age worthy of hers...at 18.5 she's elderly indeed. I suppose she's entitled to her grumps, huh? 2. I'm especially grateful for the home I inhabit. While I'd change certain things if I could, the most important aspect of this place is that it is smoke-free and will remain so. I'm grateful that every breath I take is clear of contaminants. I have a wonderful landlord & lady for my next door neighbors, and you can't ask for much more than that. 3. These days, I'm more than thankful that there's food in my larder. All the food banks are stretched to capacity this year, so this fall I've been adding a few extra things to my grocery cart each week to contribute to a couple of different food drives we have locally. I'm extremely thankful that I can afford to spend a little to help others who have the need. It hasn't always been the case in my life - I've been the one in need before and so I remember how it felt when someone helped me out. If you find yourself in a spot where you can, I hope you will help your own local food bank this holiday season. They need you! 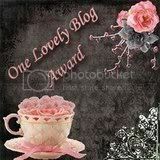 Let me know if you're contributing to the Thankful Thursdays, as I'd like to visit and read your lists! 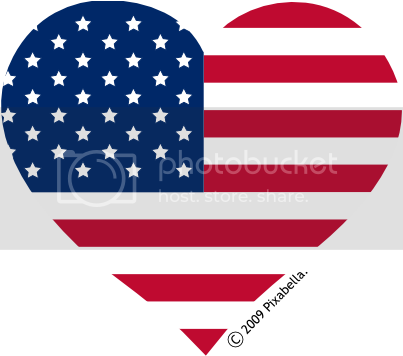 And thank you to Navy Mom Julie for the clip-art heart flag, as well as a huge thank you to every veteran today. I'm lucky to have today as a paid holiday, and have been slow to get started this morning, but I'm intent on making progress on a long-neglected knitting project and along with a bit of cleaning here in the house. It's absolutely pouring around here (a tropical un-named storm!). 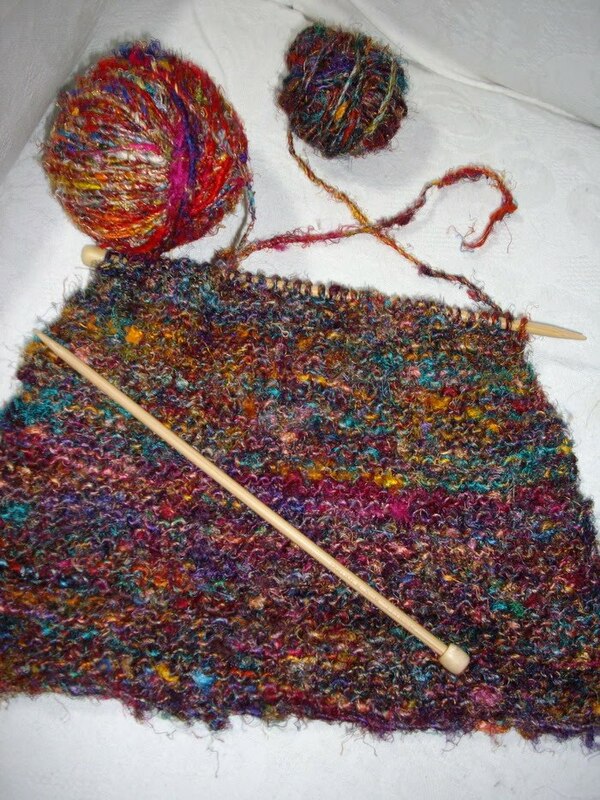 What's Wrong With This Noro Scarf? Or...Is It Monday or Something? 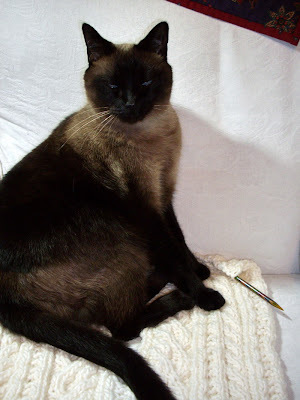 I am about to take a serious break from knitting...could this become a yoga blog, perhaps? I frogged the EZ Mittens. They were, for whatever reason, impossible for me. This is the side with the first row of color change. I think it's much more even, and "nice." Right? The idea of a yoga blog is sounding quite appealing. And B-R-E-A-T-H-E! 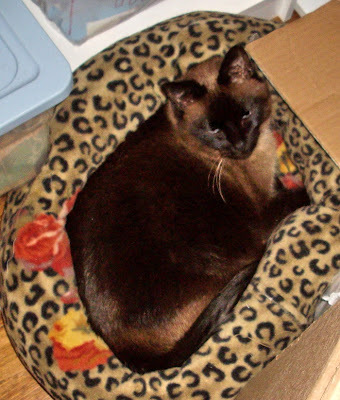 BTW, The Meezer can't be called Sneezer any longer. As soon as I published that blog post, she stopped...thank you all for your concern, and Carrie I had no idea kitties could get H1N1!!! It's been a busy weekend. Yesterday morning I was at a local department store, early-early, to help sell coupons for a Charity Sale they put on a couple of times a year. The nonprofits involved get to split the money for the coupon sales (they're $5 off your purchase) and the store sweetens the deal by running a sale on items that rarely, if ever, go on sale. I actually picked up a Fossil wallet for a fraction of the regular cost! (YAY! I would never have bought one otherwise). 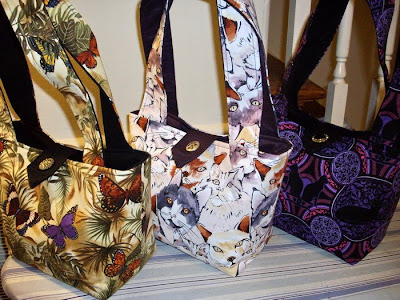 Two more and I know, it's amazing, please don't spit coffee at the computer, but there are NO CATS in these two bags!!! 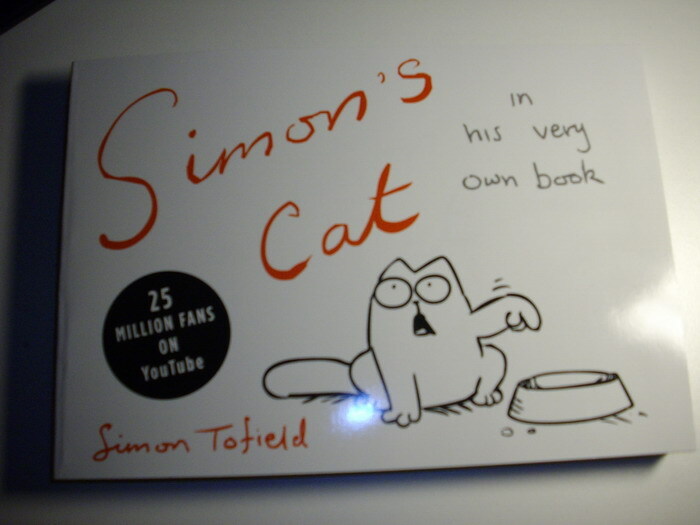 I told you I don't *just* do cats!!! But just so you don't think I've gone and lost my mind completely? 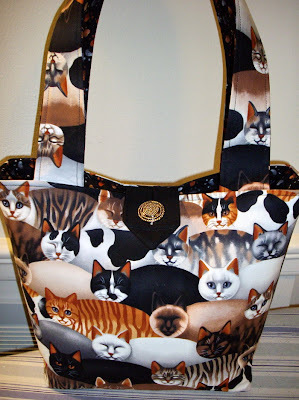 Here's another cat bag - and the very last order from the show! Whoohoo!! So this afternoon, my sis-in-law and I will go to a lovely symphony matinee and I can relax a bit. 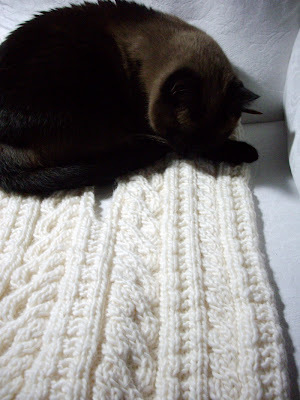 In the meantime, I'll call her "Sneezer Meezer..."
So Tell Us, Knitnana, How Was The Show? Ok...some of you have heard from me via email in reply, but I'll admit I had to think how I'd post this. Avenue Q is a rather unorthodox musical. It gives all the appearance of being suitable for children, since the characters are hand puppets. Don't be fooled! It's a raucous, bawdy, definitely adult comedy. With adult themes that could offend some people. The puppets make the entire thing lighthearted and fun. The songs are catchy things that have you toe-tapping in your seat. You cheer for certain characters, and smirk at others. But the entire premise is that these youngsters (and they are 20-somethings living on Avenue Q in NYC) are learning about life and doing it the hard way (as most of us do). I don't think anyone who saw this would feel that it wasn't something they'd had to encounter and learn to deal with as a young adult: relationships, friendships, new jobs, job losses, finding out what they're meant to do in life, or perhaps that they haven't a clue and won't figure it out anytime soon. And thru it all, they have a blast. And make us laugh. But. All that said, it's quite riske. So be prepared if you get the chance to see it. Well...I LOVED IT. But had I just heard about it from someone else, or read about it? I'm not sure I'd have gone. We were lucky to have tickets given to us. So we went, with no real idea what to expect. Just a simple black T.
After that? It was just a quick swipe with the lipstick, toss on the black swing coat, throw the shawl over my shoulders and dash out the door. 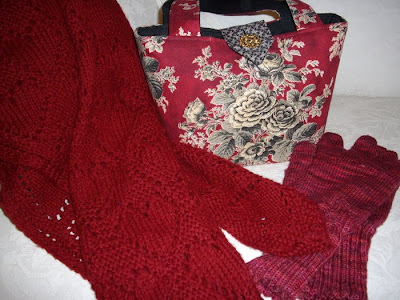 A night on the town for Knitnana (aka Nana Sadie Rose) in handknits! Whoohoo! Carole suggested that we consider posting Three Things We're Thankful For every Thursday in November, and I thought that I could surely include this in my weekly posts. Obviously, as most of us would, I have to say I'm thankful for my family and friends (which include my blog- and online-buddies!). You all keep me sane, mostly reeled in on some of my wilder stuff, and support and encourage me. I could not do any of what I do with out you. Equally obviously, I'm thankful for my work. I'm very lucky to have a full-time position in this economic environment when so many don't, but I also have a part-time business client I care about and respect, and fabulous customers who sustain Nana Sadie Rose. I couldn't ask for better. And today, I have to say I'm very grateful for my health. Even if it's not always tip-top, even with some challenges, my body puts up with a lot (I'm a hard task-master) and keeps on going. I'm finally beginning to try to take better care of it in recent years, and I'm very grateful that it has hung on long enough to reap the benefits of that care. It had to slap me upside the head a few times to wake me up to the prospect, but that's okay. I'm very grateful for it's resilience. Tune in next week and see what I come up with for my next three! (I'll be thinking on it). And join in with us if you'd like! 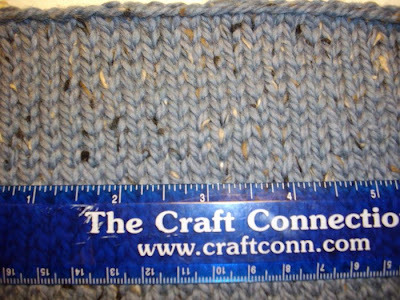 Yarn: Knitpicks City Tweed DK in Orca. 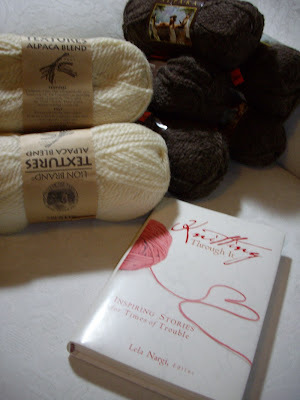 Notes: Next time I'll buy more yarn. 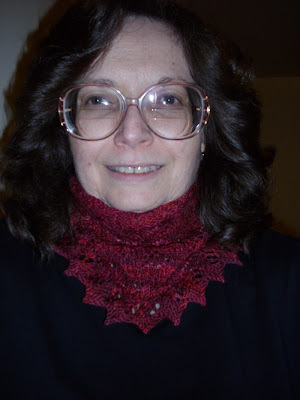 It's a very small shawlette. It might end up being someone's gift, because it's really too small for me - the blocked size of 60x29 shrunk once it was unpinned, of course. I used most of 3 skeins so next time? I'll definitely use 5. And yes, there will be a next time. I LOVE this pattern. And if you look left? I have two narrow windows that lead to nowhere (they've built on to the back and side of the building and what I have was a corner office - but not anymore). 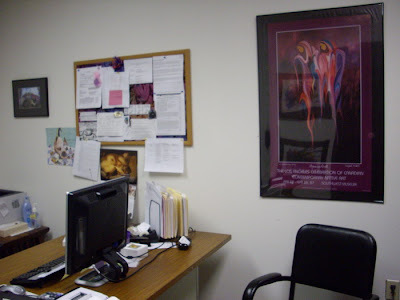 So I have two dusky amethyst drapes hung (leftovers from an old apartment)...and yes, everything in my office tends towards purple, fushia and copper (which is a nice word for the burnt orange office carpeting and "oak" desktop) with black filing cabinets. People walk into my office and go "wow!" 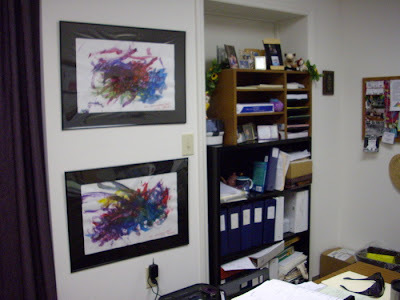 The pictures on the wall above are two pieces of original art - by two little boys near to my heart. They were my 50th birthday presents (and this was before the youngest DGS was born). The huge piece in the first photo is an art poster from the Los Angeles Celebration of Canadian Contemporary Native Art back in 1987 called "My Grandmother, Myself" by artist Maxine Noel. I've had it for years but only recently got it framed and up on the wall - it's one of my favorite pieces - I can only imagine how beautiful the original must be. I found it back in my "feminist/womanist" activism days at the Women's Center at Virginia Tech. It speaks to my steadfast insistence of the critical importance in women's lives of the concept of matriarchal lineage back to the dawn of time. I read somewhere that our cells remember, even if our minds can't recall, the stories of our foremothers and grandmothers. I believe that, with all my heart. Fascinating. I'll be sure and tell you how it ends, okay? And the number one, all time, sure-fire way I waste time online? You Knew I Wouldn't Last, Right? Sorry about the lousy photo. Yes, you're seeing that right - it's my October edition of the Personal Sock Club. I know. I said wasn't going to put socks on the needles right now. Well...I'm seriously debating taking both pair of mitts/mittens OFF the needles. The lace isn't showing up at all in the Spiralucious mitts because the yarn, lovely as it is, is too busy. And I have no idea why I can't get EZ's Mitered Mittens to work properly, but they're not. Anyway. I have to have easy and small to work on at work. And it seems to be all my brain will deal with right now. So. BTW...Hello?? Knock-knock - is thing on? Remember that old blog button of the old woman saying "Would it kill ya to comment?" I'm going looking for her...I miss you guys. Please let me know when you stop by!